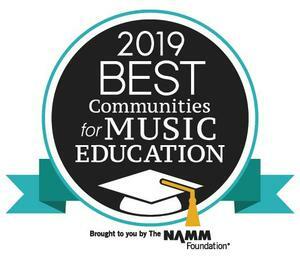 Now in its 20th year, the Best Communities for Music Education designation is awarded to districts that demonstrate outstanding achievement in efforts to provide music access and education to all students. To qualify for the Best Communities designation, VISD answered detailed questions about funding, graduation requirements, music class participation, instruction time, facilities, and support for the music programs. Responses were verified with school officials and reviewed by The Music Research Institute at the University of Kansas. This award recognizes that VISD is leading the way with learning opportunities as outlined in the Every Student Succeeds Act (ESSA). The legislation guides implementation in the states and replaces the No Child Left Behind Act (NCLB) which was often criticized for an overemphasis on testing-while leaving behind subjects such as music. ESSA recommends music and the arts as important elements of a well-rounded education for all children. “Music education helps develop the brain, fostering problem solving and critical thinking skills that are essential in the learning process,” said VISD elementary music teacher Laura Goedrich. Research into music education continues to demonstrate educational/cognitive and social skill benefits for children who make music. After two years of music education, research found that participants showed more substantial improvements in how the brain processes speech and reading scores that their less-involved peers and that students who are involved in music are not only more likely to graduate high school, but to attend college as well. Everyday listening skills are stronger in musically-trained children that in those without music training. Significantly, listening skills are closely tied to the ability to: perceive speech in a noisy background, pay attention, and keep sounds in memory. Later in life, individuals who took music lessons as children show stronger neural processing of sound; young adults and even older adults who have not played an instrument for up to 50 years show enhanced neural processing compared to their peers. Not to mention, social benefits include conflict resolution, teamwork skills, and how to give and receive constructive criticism. VISD provides students with a variety of music education options, including elementary music class, band, orchestra, choir, jazz band, mariachi, and guitar. More than 8,000 of the nearly 14,000 students in the district are currently involved in at least one of these opportunities.